As I proclaim at any chance that presents itself, Ottawa is a great biking city. As my last post told tales of MosaiCanada 150 and Kontinuum, events that are fantastic, but temporary, this post is all about bike routes that you can try any old time (that it’s not snowing). As a warning, this is not a tale for serious bikers who want to pump out the kms. This is a leisurely, social cycle with copious stops, relaxing opportunities and a good dollop of beer calories. If you’re a tourist renting bikes from downtown Ottawa this route requires no driving. Depending where you live, you may also be lucky enough for that to work for you as well! Bring water, a bathing suit, a picnic.. or whatever your heart desires. We usually drive down the Sir John A. Macdonald Parkway and park in the large parking lot right beside the Island Park Bridge. There are multiple parking lots along the parkway, but we like that this one because it is almost half way along our ride. There are so many options for biking the Ottawa River Parkway that this is going to start resembling a ‘choose your own adventure’ book. On the bright side, that means you can bike up and down the parkway multiple times without having to stop at the same place twice! Last week we were interested in a longer biking day, so we first headed west from the parking lot (left if you’re facing the water). The Ottawa River Pathway skirts the river the whole way, so if it’s watery vistas you’re into- this is a great path. Your first possible stop is the Kitchissippi Lookout, which is at Westboro beach. Also at Westboro Beach, alongside a nice little stretch of sand, is the Westboro Beach Club and its relaxing patio. Enjoy a beer, reasonably priced food and make plans to come back one evening for live music (Summers: Thurs-Sun). There is parking and bathrooms here, too. If you haven’t quite worked up an appetite yet continue on down the pathway to Britannia Bay. Here you’ll find an expansive beach made for picnics and the Baja Burger Shack, in case you forgot to bring your picnic basket. Don’t worry, they serve beer on their patio as well, so you won’t go thirsty if you’re hoping for some hops. Back on the bikes we headed back east, although If you’re feeling energetic, go ahead and satisfy your need to ‘Go West, young man.’ Whenever you do turn around, you’ll probably be jonesing for something sweet at the exact time that the pathway leads you directly to the Beachconer’s MicroCreamery (at the corner or Britannia Rd and Howe St). Since homemade icecream is pretty much the definition of a summer treat, this may well be the highlight of your day. Now to burn off those creamy calories. Keep on trekking east and wave at your car as you pass it in the parking lot. Who needs 4 wheels when you have 2? Don’t offend your vehicle too much- you will eventually return to it with the expectation of delivering you safely home. If you started off your day with a massive breakfast and are just now getting hungry, there are lots of great grassy areas to stop for a picnic in this easterly direction. Your next stop should be the impressive rock Inukshuks at Remic Rapids Park created by Ottawa artist John Ceprano. Further down the path you’ll pass the Canadian War museum and a few minutes later, if you stay on the Ottawa River parkway you’ll come to the Mill Street Pub. Put a mental pin in this location. 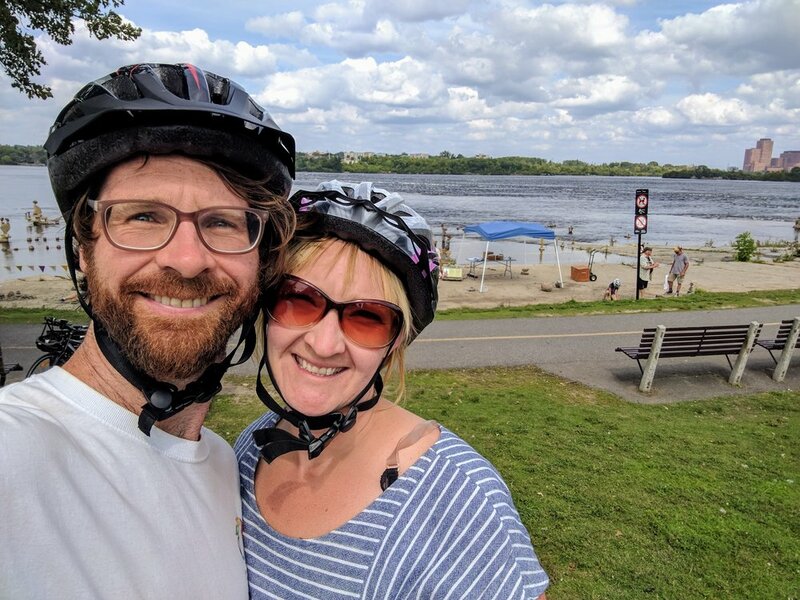 The furthest point we like to bike to are the Rideau locks at the base of Parliament approximately another 25 minute ride down the path from Remi Rapids. In the summer you can see boats using the locks, or you can sit and enjoy the views across the river. In celebration of a day well spent head back to that Mill Street BrewPub that you have been thinking about since you cycled past half an hour ago. This patio is one of our favourites. With a great variety of beer, live music from time to time and brewery tours on weekends you won’t be disappointed with a stop here.